Eratosthenes' method for determining the circumference of the Earth, with sunbeams shown as two rays hitting the ground at two locations in Egypt – Syene (Aswan) and Alexandria. Earth's circumference is the distance around the Earth, either around the equator (40,075.017 km [ 24,901.461 mi ]) or around the poles (40,007.86 km [ 24,859.73 mi ]). Measurement of Earth's circumference has been important to navigation since ancient times. It was first calculated by Eratosthenes, which he did by comparing altitudes of the mid-day sun at two places a known north–south distance apart. In the Middle Ages, Al Biruni calculated a more accurate version, becoming the first person to perform the calculation based on data from a single location. In modern times, Earth's circumference has been used to define fundamental units of measurement of length: the nautical mile in the seventeenth century and the metre in the eighteenth. Earth's polar circumference is very near to 21,600 nautical miles because the nautical mile was intended to express 1/60TH of a degree of latitude (i.e. 60 × 360), which is 21,600 partitions of the polar circumference. The polar circumference is even closer to 40,000 kilometres because the metre was originally defined to be one 10-millionth the distance from pole to equator. The physical length of each unit of measure has remained close to what it was determined to be at the time, but the precision of measuring the circumference has improved since then. Treated as a sphere, determining Earth's circumference would be its single most important measurement (Earth actually deviates from a sphere by about 0.3% as characterized by flattening). Illustration showing a portion of the globe showing a part of the African continent. The sun beams shown as two rays hitting earth at Syene and Alexandria. Angle of sun beam and the gnomons (vertical sticks) is shown at Alexandria which allowed Eratosthenes' estimate of the circumference of Earth. According to Cleomedes' On the Circular Motions of the Celestial Bodies, around 240 BC, Eratosthenes, the librarian of the Library of Alexandria, calculated the circumference of the Earth in Ptolemaic Egypt. Using a scaphe, he knew that at local noon on the summer solstice in Syene (modern Aswan, Egypt), the Sun was directly overhead. (Syene is at latitude 24°05′ North, near to the Tropic of Cancer, which was 23°42′ North in 100 BC.) He knew this because the shadow of someone looking down a deep well at that time in Syene blocked the reflection of the Sun on the water. He then measured the Sun's angle of elevation at noon in Alexandria by using a vertical rod, known as a gnomon, and measuring the length of its shadow on the ground. Using the length of the rod, and the length of the shadow, as the legs of a triangle, he calculated the angle of the sun's rays. This angle was about 7°, or 1/50th the circumference of a circle; taking the Earth as perfectly spherical, he concluded that the Earth's circumference was 50 times the known distance from Alexandra to Syene (5,000 stadia, a figure that was checked yearly), i.e. 250,000 stadia. Depending on whether he used the "Olympic stade" (176.4 m) or the Italian stade (184.8 m), this would imply a circumference of 44,100 km (an error of 10%) or 46,100 km, an error of 15%. In 2012, Anthony Abreu Mora repeated Eratosthenes's calculation with more accurate data; the result was 40,074 km, which is 66 km different (0.16%) from the currently accepted polar circumference. Posidonius calculated the Earth's circumference by reference to the position of the star Canopus. As explained by Cleomedes, Posidonius observed Canopus on but never above the horizon at Rhodes, while at Alexandria he saw it ascend as far as ​7 1⁄2 degrees above the horizon (the meridian arc between the latitude of the two locales is actually 5 degrees 14 minutes). Since he thought Rhodes was 5,000 stadia due north of Alexandria, and the difference in the star's elevation indicated the distance between the two locales was 1/48 of the circle, he multiplied 5,000 by 48 to arrive at a figure of 240,000 stadia for the circumference of the earth. It is generally thought that the stadion used by Posidonius was almost exactly 1/10 of a modern statute mile. Thus Posidonius's measure of 240,000 stadia translates to 24,000 mi (39,000 km), not much short of the actual circumference of 24,901 mi (40,074 km). Strabo noted that the distance between Rhodes and Alexandria is 3,750 stadia, and reported Posidonius's estimate of the Earth's circumference to be 180,000 stadia or 18,000 mi (29,000 km). Pliny the Elder mentions Posidonius among his sources and without naming him reported his method for estimating the Earth's circumference. He noted, however, that Hipparchus had added some 26,000 stadia to Eratosthenes's estimate. The smaller value offered by Strabo and the different lengths of Greek and Roman stadia have created a persistent confusion around Posidonius's result. Ptolemy used Posidonius's lower value of 180,000 stades (about 33% too low) for the earth's circumference in his Geography. This was the number used by Christopher Columbus in order to underestimate the distance to India as 70,000 stades. 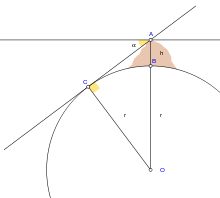 Diagram showing how Al Biruni was able to calculate the Earth’s circumference from a high point and a low point at the same location. A more accurate estimate was provided in Al-Biruni's Codex Masudicus (1037). In contrast to his predecessors, who measured the Earth's circumference by sighting the Sun simultaneously from two different locations, al-Biruni developed a new method of using trigonometric calculations, based on the angle between a plain and mountain top, which yielded more accurate measurements of the Earth's circumference, and made it possible for it to be measured by a single person from a single location. 1,700 years after Eratosthenes's death, while Christopher Columbus studied what Eratosthenes had written about the size of the Earth, he chose to believe, based on a map by Toscanelli, that the Earth's circumference was one-third smaller. Had Columbus set sail knowing that Eratosthenes's larger circumference value was more accurate, he would have known that the place that he made landfall was not Asia, but rather the New World. Both the metre and the nautical mile were originally defined as a subdivision of the Earth's circumference; today the circumference around the poles is very nearly 40,000 km and 360 × 60 nautical miles long. In 1617 the Dutch scientist Willebrord Snellius assessed the circumference of the Earth at 24,630 Roman miles (24,024 statute miles). Around that time British mathematician Edmund Gunter improved navigational tools including a new quadrant to determine latitude at sea. He reasoned that the lines of latitude could be used as the basis for a unit of measurement for distance and proposed the nautical mile as one minute or one-sixtieth (1/60) of one degree of latitude. As one degree is 1/360 of a circle, one minute of arc is 1/21600 of a circle – such that the polar circumference of the Earth would be exactly 21,600 miles. Gunter used Snell's circumference to define a nautical mile as 6,080 feet, the length of one minute of arc at 48 degrees latitude. In 1791, the French Academy of Sciences selected the circumference definition over the alternative pendular definition because the force of gravity varies slightly over the surface of the Earth, which affects the period of a pendulum. To establish a universally accepted foundation for the definition of the metre, more accurate measurements of this meridian were needed. The French Academy of Sciences commissioned an expion led by Jean Baptiste Joseph Delambre and Pierre Méchain, lasting from 1792 to 1799, which attempted to accurately measure the distance between a belfry in Dunkerque and Montjuïc castle in Barcelona to estimate the length of the meridian arc through Dunkerque. This portion of the meridian, assumed to be the same length as the Paris meridian, was to serve as the basis for the length of the half meridian connecting the North Pole with the Equator. The problem with this approach is that the exact shape of the Earth is not a simple mathematical shape, such as a sphere or oblate spheroid, at the level of precision required for defining a standard of length. The irregular and particular shape of the Earth smoothed to sea level is represented by a mathematical model called a geoid, which literally means "Earth-shaped". Despite these issues, in 1793 France adopted this definition of the metre as its official unit of length based on provisional results from this expion. However, it was later determined that the first prototype metre bar was short by about 200 micrometres because of miscalculation of the flattening of the Earth, making the prototype about 0.02% shorter than the original proposed definition of the metre. Regardless, this length became the French standard and was progressively adopted by other countries in Europe. Wikimedia Commons has media related to Earth's circumference. Krebs, Robert E.; Krebs, Carolyn A. (2003). "Calculating the Earth's Circumference". Groundbreaking Scientific Experiments, Inventions, and Discoveries of the Ancient World. Greenwood Publishing Group. p. 52. ISBN 978-0-313-31342-4. Nicastro, Nicholas (25 November 2008). Circumference: Eratosthenes and the Ancient Quest to Measure the Globe. St. Martin's Press. ISBN 978-1-4299-5819-6. Gow, Mary (1 July 2009). Measuring the Earth: Eratosthenes and His Celestial Geometry. Enslow Publishing, LLC. ISBN 978-0-7660-3120-3. Lowrie, William (20 September 2007). Fundamentals of Geophysics. Cambridge University Press. ISBN 978-1-139-46595-3. ^ World Geodetic System (WGS-84). Available online from National Geospatial-Intelligence Agency. ^ Humerfelt, Sigurd (26 October 2010). "How WGS 84 defines Earth". Archived from the original on 24 April 2011. Retrieved 29 April 2011. ^ Shashi Shekhar; Hui Xiong (12 December 2007). Encyclopedia of GIS. Springer Science & Business Media. pp. 638–640. ISBN 978-0-387-30858-6. ^ Van Helden, Albert (1985). Measuring the Universe: Cosmic Dimensions from Aristarchus to Halley. University of Chicago Press. pp. 4–5. ISBN 978-0-226-84882-2. ^ "Astronomy 101 Specials: Eratosthenes and the Size of the Earth". www.eg.bucknell.edu. Retrieved 19 December 2017. ^ a b "How did Eratosthenes measure the circumference of the earth?". 3 July 2012. ^ a b "Eratosthenes and the Mystery of the Stades – How Long Is a Stade? – Mathematical Association of America". www.maa.org. ^ Cleomedes (in Fragment 202) stated that if the distance is measured by some other number the result will be different, and using 3,750 instead of 5,000 produces this estimation: 3,750 x 48 = 180,000; see Fischer I., (1975), Another Look at Eratosthenes' and Posidonius' Determinations of the Earth's Circumference, Ql. J. of the Royal Astron. Soc., Vol. 16, p.152. ^ King, David A. (1996). Rashed, Roshdi (ed.). Astronomy and Islamic society: Qibla, gnomics and timekeeping (PDF). Encyclopedia of the History of Arabic Science. 1. pp. 128–184. ISBN 978-0203711842. Retrieved 10 November 2016. ^ Aber, James Sandusky (2003). "Abu Rayhan al-Biruni". academic.emporia.edu. Emporia State University. Retrieved 10 November 2016. ^ Goodman, Lenn Evan (1992). Avicenna. Great Britain: Routledge. p. 31. ISBN 978-0415019293. Retrieved 10 November 2016. It was Biruni, not Avicenna, who found a way for a single man, at a single moment, to measure the earth's circumference, by trigonometric calculations based on angles measured from a mountaintop and the plain beneath it – thus improving on Eratosthenes' method of sighting the sun simultaneously from two different sites, applied in the ninth century by astronomers of the Khalif al-Ma'mun. ^ Gow, Mary. "Measuring the Earth: Eratosthenes and His Celestial Geometry, p. 6 (Berkeley Heights, NJ: Enslow, 2010). ^ Garrison, Peter (April 2008). "Old Wings". Flying Magazine: 90. ISSN 0015-4806. : "The kilometer, which is the foundation of the entire SI or “metric” system, was originally intended to be 1/10,000th of a quadrant of a meridian — that is, 1/40,000th of the earth's polar circumference — and was established as such in 1793... The nautical mile, like the kilometer, is a unit based on the dimensions of the earth. It is the length of one minute of arc along a meridian. (The meridians are the lines that run from pole to pole on the globe; the other ones are called parallels, and minutes of arc on them shrink toward the poles.) One minute of arc is 1/21,600th of a full circumference, and so the polar circumference of the earth... is 21,600 nautical miles." ^ Marine Insight, Why Nautical Mile and Knot Are The Units Used at Sea? ^ a b Alder, Ken (October 2003). The Measure of All Things: The Seven-Year Odyssey and Hidden Error That Transformed the World. Simon and Schuster. ISBN 978-0-7432-1676-0.